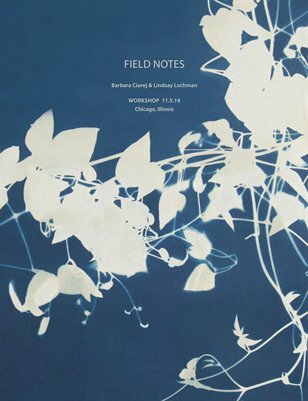 Field Notes is a catalog of collected writings from a botanically themed workshop hosted by Barbara Ciurej and Lindsay Lochman in conjunction with the exhibition The Nature of a Collective. Led by writer Anja Notanja Sieger, participants considered the process of regeneration and elaborated upon the forces found within the plant world and our connections to these forces in a series of quick, collaborative writing exercises. Photographers Barbara Ciurej and Lindsay Lochman framed the texts cultivated in these exercises with photographic images they made in response to the workshop writing. This catalog records an exercise in regeneration – sowing seeds and watching how they grow – connecting the many paths of how we come to know.